But I never wore it out. It wasn’t exactly ‘cool’ to wear a tweed set in middle school, at least not among preteen and teenaged girls. And I already had a penchant for dressing like a woman my current age, with an extensive sweater and cardigan collection that received more compliments from my teachers than my peers. By the time I was confident enough to just wear it, it didn’t fit me anymore. And I regret never having worn it so much! I guess I’m making up for lost time, because now I’m the teacher, and almost 28, and all I seem to wear in the fall and winter months are matching sets and tweed—I have a couple tweed skirts on rotation, and one sparkly matching skirt and jacket set from Ann Taylor that I love to wear closer to the holidays. 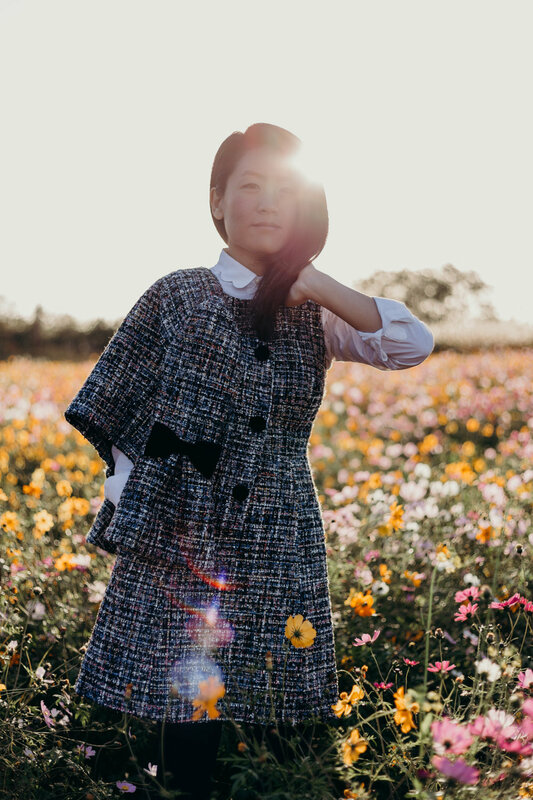 Imagine my excitement then, when I spotted this tweed jacket and skirt set from Gal Meets Glam Collection a couple launches ago (see in this post), and again when Gal Meets Glam contacted us to feature me in their Gal on the Go series (!?!?! ), an event so exciting, I convinced myself I dreamt it, until the Maggie, Nell, and my favorite, Katherine arrived. The Katherine, blue with pink thread and sequins woven in, is gorgeous on its own, with a shirt or turtleneck paired underneath, with a cardigan over it, and of course, with its matching jacket, one that is so special and unique, I’ve been brainstorming all the possible ways I can wear it. I wore it to work on Monday for a touch of glam, with a scoop-neck top underneath, a black high-waisted pencil skirt, and boots. The Nell is a sweet silhouette in wine pink tweed with cap sleeves and velvet trim details, which are also featured on the matching jacket. Professional enough for work and perfect for special occasions, the Nell might be the one I take from classes during the day to celebrations at night on my birthday! 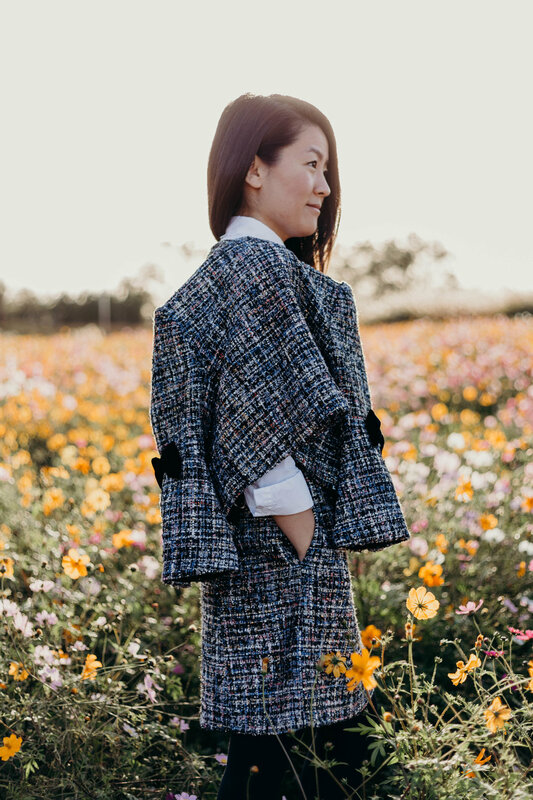 The thing about tweed sets is that they are so versatile—you can mix and match them in so many ways, and with so many other pieces in your wardrobe. With such pretty details, and in such classic silhouettes and soft fabrics, I know these will be pieces that remain in my wardrobe for years to come! 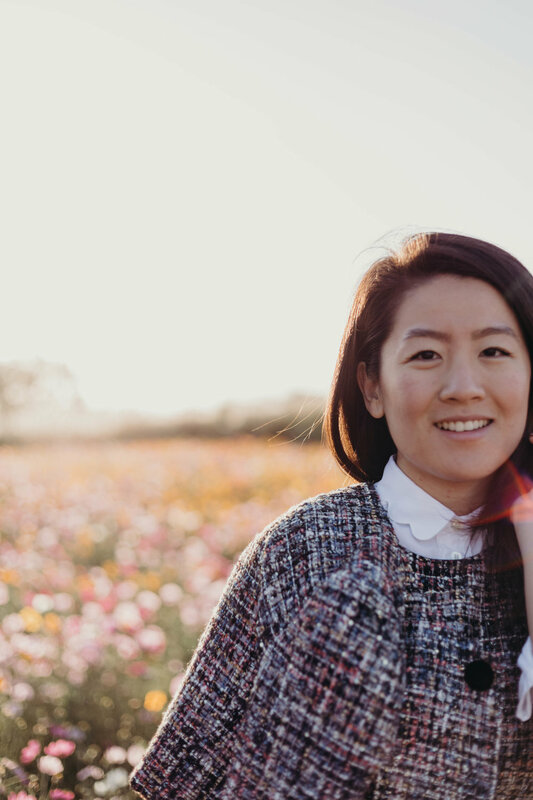 We shot the Katherine in the fields at Haneul (Sky) Park, situated at the highest point of the park, where cosmos bloom and there are miles of eulalia grass through October and early November, and along the Metasequoia path. 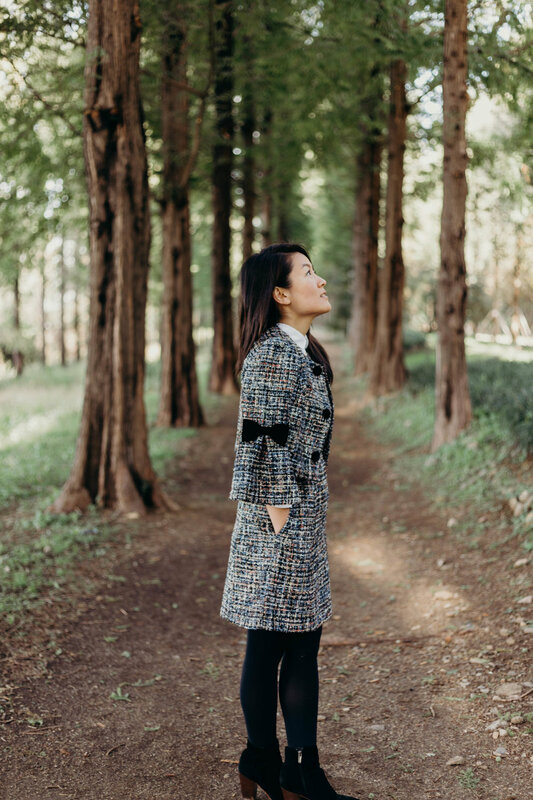 See more of our favorite things to do and places to explore in Seoul in our Gal on the Go feature!